BNP Paribas’ new European digital bank, Hello Bank! gives social customer care (webchat, twitter, facebook) center stage in their latest TV ads. A few days ago, Hello Bank published on its official YouTube channel another three videos putting the emphasis on their social customer care service via webchat (or arguably twitter for that matter): ‘Hello bank! — Livret Hello! À 2% sans plafond, et pour longtemps‘ and ‘Hello bank! — Carte Visa gratuite à vie‘. 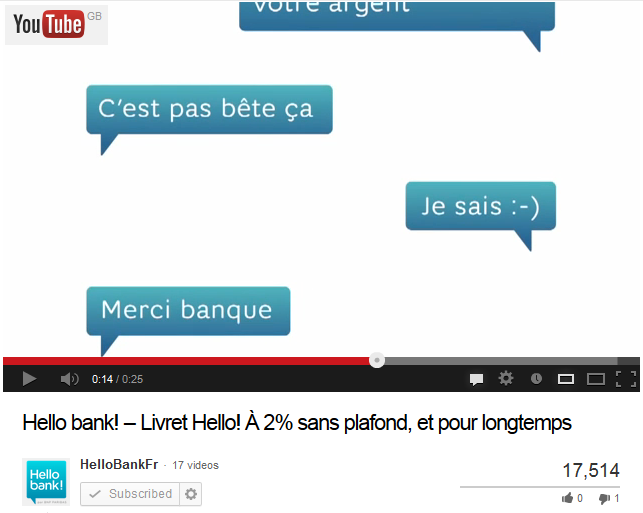 Please note that the 100% digital French bank started to adopt this customer dialog via text/webchat/twitter for their commercials about two months ago when they published this video ‘Hello bank! — Disponible quand vous l’êtes‘. It seems like BNP Paribas dedicated some budget for video seeding, their first two videos each totaling over 100,000 views. And the latest three videos all already enjoying between 20k-25k views in just 3 days. In addition to a link to their website, most of Hello Bank’s videos includes a couple of social media links to the bank’s verified facebook page and twitter account. Few financial institutions are renowned for the excellence of their customer service, even fewer for their effort on social customer care or via mobile. HSBC’s first direct in the UK is one of that rare breed of financial brands loved by their customers for the hundreds of magical conversations the fd staff -carefully recruited- have with their customers on daily basis. In the last couple of years, other banks cleverly seized the opportunity offered on digital and social media channels to step up and establishing themselves as the champions to the banking customers such as FNB in South Africa, NAB in Australia, GTBank in Nigeria, Societe Generale and BNP Paribas in France just to name a few. What do you think of BNP Paribas Hello Bank‘s focus on chat and social customer care. In your opinion, is it the best way to connect with the youth, and drive both brand consideration and customer acquisition on the back of it within that customer segment? We invite you to share your views on social customer care as a bank’s best marketing tool here or on twitter.